Northern Hardwood Company offers a diverse line of 3rd generation vinyl sports flooring, from the ever more popular maple print to solid color installations and combinations. Our products can be adhered directly to the substrate or floating, if vapor emission is an issue. Our new finishing system is a clear urethane top coat which enables and ensures that painted game lines will adhere well and provide years of longevity, even under the use of heavy auto scrubbers. Our state of the art installation and seam welding tools ensure precision installations. 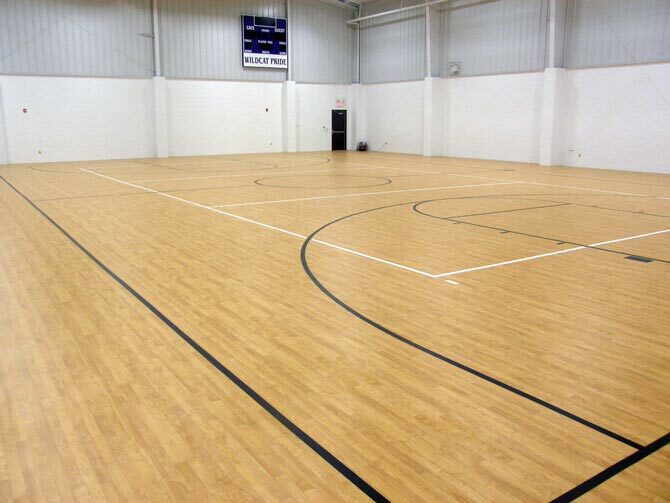 With many options to choose from in both style and appearance, we can provide vinyl sports flooring with a wood grain look, solid color look and even custom colors to match a school or businesses preference.